High-flier: A file photo of a Bombardier Challenger 300 business jet. The demand for private jets has been growing steadily in India. India’s growing breed of high net worth individuals and corporate chieftains, who are increasingly required to jet across the globe to attend to their growing business needs, has caught the attention of aviation services company BJets, part of the privately held, Singapore-based investment company Briley Group, which has holdings in aviation, hospitality, business process outsourcing and technology. “We are in the research stage just now and hope to arrive at a conclusion by early next year," said Mark Baier, head of BJets global operations, who was in India last week. “We are confident there is a market here considering the way businesses are growing. We are examining the viability of operations in India." BJets, based out of Singapore, plans to offer its services in India, China and the rest of Asia. “BJets caters to business customers that find the extreme need to gain time in today’s demanding business environment, control their own schedules, explore more opportunities, travel safely and securely, and achieve crucial face-to-face interaction with customers and prospects nationally and internationally," according to the company’s website. The company is right now in the process of working out its business models, said Baier, who met potential business associates in India. “Over the next few months, it will be clear to us whether we should first start operations in India or China," he said. People familiar with BJets’ plans say it has already started groundwork to start operations in India, including recruitment of staff for its fleet of aircraft. The demand for private jets has been steadily growing in India. Apart from the Tatas, the Birlas and the Reliance group, a string of other companies with national and international footprints have been exploring the option of buying their own aircraft or leasing them in order to save time for their senior executives, who have to travel across facilities. Since buying involves capital expenditure and annual maintenance, some of them are exploring the option of renting aircraft. 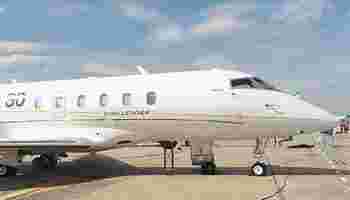 Private jets could cost anywhere between a few crores and Rs300 crore, depending on the features. Hawker Beechcraft Corp., which makes business jets, is looking at selling 120 mid-sized business jets in India over the next few years. The biggest players in this market are Bombardier Inc., Cessna Aircraft Co., Gulfstream Aerospace Corp. and Raytheon Co. Other players with a significant presence are France-based Dassault Aviation with its Falcon aircraft and Brazilian aircraft manufacturer Embraer. The Briley Group has its corporate offices in Singapore and Maryland, US, and its businesses span China, South-East Asia, Europe, North America and Australia. The group, which started companies such as InterPro and PayStaff in the business process and human resources outsourcing space in the US, is now focusing on emerging markets in Asia. Group company Corstone Capital, an investment firm focusing primarily on non-performing loans, real estate-related assets, and operating companies in Asia, was an early market entrant in China and has been one of the world’s largest acquirers and financiers of such loans in China.